Internationally renowned pianist Art Resnick has put together a new trio with a burning young rhythm section. The story of Resnick’s life and career spans many decades and several continents. Hailing from Minnesota, Resnick moved to San Francisco in 1968 during the legendary “Summer of Love,” and immediately after arriving joined a psychedelic rock band and opened frequently for iconic rock musicians like the Doors, Jefferson Airplane, and Janis Joplin. During this period, and in spite of these stylistic trappings, Resnick’s playing already reflected his interest in John Coltrane, Bill Evans and twentieth century classical music. During the following decade, he shifted his focus towards the jazz world, playing and teaching in New York, San Diego, and Alaska. In 1980 Art spent a month in Australia playing with jazz icon Freddie Hubbard. A little later, Resnick spent several years in Paris, and it was there that Portland drummer Alan Jones piqued his interest in the Pacific Northwest. Since arriving here in Portland in 1990, Resnick has kept busy working with various notable trios and quartets, painting, sculpting, and composing for both chamber and jazz ensembles. Resnick is regularly featured by non-profit presenting agency Cascadia Composers, showcasing his unique blend of post-Stravinsky chamber composition and authentic fifties style swing and bebop. In addition to music from the new trio, “1,2,3” features a sonata he composed for piano and saxophone. This piece is performed here with PJCE Records label-mate Blake Lyman. The Art Resnick Trio is notable because of its leaders impressive credentials and unique approach, but also because it is a rare thing: an inter-generational band featuring an established voice working with a fiery young rhythm section. Bassist Jon Shaw (Blue Cranes, Gunga Galunga) has been a rising star on the Portland jazz scene these last few years and has quickly become ubiquitous in the creative music community. Drummer Sam Foulger (Blake Lyman Quintet, Tony Starlight Band) has cultivated a sound that is both forward thinking and deeply rooted in tradition. This powerful, dynamic young rhythm section provides a sensitive context for Resnick’s compositions and improvisation, allowing the music to revel in its wild idiosyncrasies while remaining firmly grounded in familiar stylistic territory. 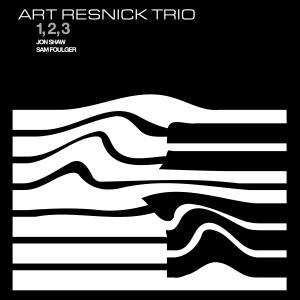 The result is an impressive debut from the newest iteration of the Art Resnick Trio.